Often called Guay Tiew Kaak in Thailand, which literally translates as "Noodles of Indians", this distinctive, aromatic noodle soup is like none you've ever tasted! We call it Maha Raja, and as the name suggests, this particular native noodle soup was born in the Southern region of Thailand, where Thai cooking is often influenced by the exotic spices & rich curries of neighboring India, Indonesia and Malaysia. 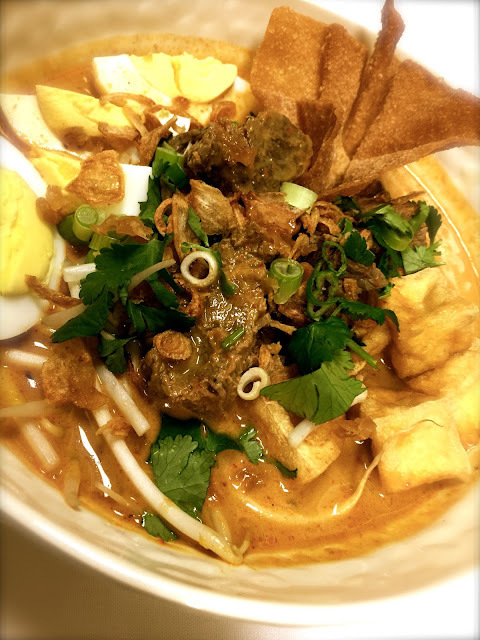 The curry broth in our Maha Raja is rich in flavor, yet delicate in composition. The mildly sweet flavors of coconut & peanut are perfectly balanced by the tangy spice of chilies, garlic and lime. Rabieng's Maha Raja noodle soup is an authentic homage to the original with tender stewed cubed beef, thin rice noodles, sprouts, fried tofu, boiled egg, crispy shallots. Not many, if any Thai restaurants in America serve Guay Tiew Kaak, so what are you waiting for?! Rabieng Thai Restaurant. All rights reserved. Copyright 2019. Awesome Inc. theme. Powered by Blogger.